Folks, I thought I’d make sure y’all are aware of Inkscape, a graphic design software that’s completely free and useful for embroidery design. If y’all are interested in designing and want your designs in digital form, this is very useful. I scanned in a black-and-white sketch and used the Trace tool to vectorize it (vectorize – turn a drawing into geometric formulas, so it can scale smoothly to any size), and it worked great with the default settings! Here is a tutorial on the trace tool. You can also scan in photos or color drawings for tracing. 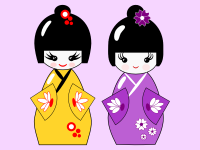 If you want to draw directly in Inkscape and want a basic overview, this tutorial teaches you to draw the two dolls in the picture. There are tons of other tutorials online too! This entry was posted in Color and design, Free resources online, tutorials and tagged embroidery, embroidery design, graphic design, vectorize. Bookmark the permalink. Thanks for that – link bookmarked for when I have a chance to study it! I’m having a whole lot of fun with it – it’s fantastic! This is more like Illustrator than Photoshop. A “layer” lets you have save different parts of the design separately. Like if you had a butterfly and a flower and a border in a design, you could have the flower on one layer, the butterfly in another, and the border in another. Then if you want to only change the butterfly, you can temporarily set the other two layers to “locked” so you CAN’T accidentally change anything in the rest of the design. Or if you want to just look at the butterfly by itself, you can “hide” the rest of the design. When you are done you can save all the “layers” together in one picture file so it looks like you did it all at once, but while you are editing it is useful to keep things separate. Thanks so much for this information! I’m interested to try this software. Do you know how to quickly make a cross-stitch design with Inkscape? No, sorry! I’ve never tried it. I used some cross-stitch software once, but it has been a very long time.